Today, a rare glimpse of the theatrical trailer for the original release of THE MASK. I'm calling this one rare because the last time I went looking on youtube I couldn't find it. I had seen it months ago courtesy of an online stock footage company and was trying to get their permission to post it for this month. Turns out I can just turn to youtube. The most interesting thing about this trailer is the inclusion of Hollywood publicity man and hoax perpetrator, Jim Moran. He made his living publicizing events and films in the most outrageous fashions, including spending 10 days searching for a needle in a haystack, parading a bull through a New York City China Shop and, for General Electric, trying to sell a fridge to an Alaskan Eskimo. All the while he was front and centre as the man perpetrating these stunts. 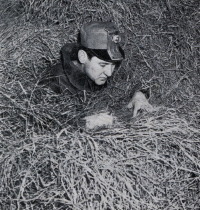 Moran searches for a needle in a haystack. In the THE MASK, Moran, "a connoisseur of all things weird", professes to be a famed a mask collector now in possession of the ancient tribal mask seen in the film. I'd often read about his appearance in both the trailer and the prologue to the film, but until I saw the trailer I'd questioned whether this material was actually filmed. The trailer proves it. I've seen the script for his prologue to the film and can only assume it was shot on the same day as his trailer appearance. I'm hoping the Lightbox screening on the 26th will offer proof of his guest appearance in the film.